Minnehaha Park is on the banks of the Mississippi, surrounding Minnehaha Creek, a tributary of the Mississippi, and Minnehaha Falls. The falls have long been an important site to the native Dakota people. Minnehaha means "falling water" in Dakota, not "laughing water" as it is often translated. 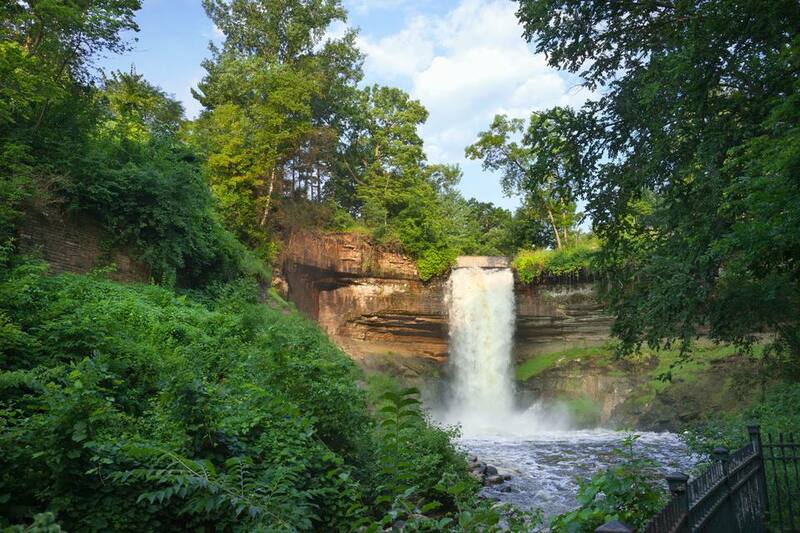 White settlers discovered the falls around 1820, not long after arriving in Minnesota. Minnehaha Falls is very close to the Mississippi River and only a couple of miles from Fort Snelling, one of the first places inhabited by settlers in the region. A small mill was built on the falls in the 1850s, but Minnehaha Falls have considerably less power than the St. Anthony Falls on the Mississippi and the mill was soon abandoned. The falls were to become a tourist destination after the publication of the epic poem The Song of Hiawatha by Henry Wadsworth Longfellow in 1855. Longfellow never visited the falls in person, but he was inspired by the works of scholars of Native American culture and images of the falls. The city of Minneapolis purchased the land in 1889 to make the area into a city park. The park has been a popular attraction for locals and tourists ever since. Minnehaha Falls are only about 10,000 years old, very young in geological time. The St. Anthony Falls, now about six miles upriver in downtown Minneapolis, used to be downstream of the confluence of the Mississippi and Minnehaha Creek. As the St. Anthony Falls eroded the river bed, the falls gradually moved upstream. When the falls reached and passed the Minnehaha Creek, a new waterfall formed on the creek, and the force of the water altered the route of the creek and the river. Now the part of the Minnehaha Creek between the falls and the Mississippi flows through the old Mississippi river bed and the Mississippi has cut a new course. A plaque on the lookout point at Minnehaha Falls has a more in-depth explanation of the fall's geology and a geological map of the area. How Tall Are the Falls? Minnehaha Falls is 53 feet high. The waterfall seems higher, especially when viewed from the base! Steps, retaining walls and a bridge surround the falls, to allow access to the base of the falls. The falls are most dramatic after heavy rains. The falls slow and sometimes dry up after long dry periods in the summer. In cold winters, the falls can freeze, creating a dramatic wall of ice. The steps down to the base of the falls can become very icy and treacherous in winter and are usually closed off until the ice thaws. The park contains several sculptures. The most well known is Jakob Fjelde's life-size bronze of Hiawatha and Minnehaha, characters from The Song of Hiawatha. The sculpture is on an island in the creek, a short way above the falls. A mask of Chief Little Crow is located near the falls. The chief was killed in the 1862 Dakota conflict. The location of the statue is in an area sacred to Native Americans. The park has picnic tables, a playground and an off-leash dog park. A bike rental company operates at the falls in the summer months. Three garden areas are in the park. The Pergola Garden overlooks the falls and is a popular wedding location. There are a seafood restaurant and bandstand at the park, both open in the summer. Minnehaha Park is located at the intersection of Hiawatha Avenue and Minnehaha Parkway, on the banks of the Mississippi, in Minneapolis. The park is just across the river from the Highland Park neighborhood of St. Paul. Parking is limited to parking meters or designated parking lots and a parking fee applies. The Hiawatha Light Rail Line trains stop at 50th Street/Minnehaha Park, a short walk from the park. Every year, half a million people visit Minnehaha Park, so it's likely to be busy particularly on summer weekends. What's the Best Place to Live in Minneapolis?